After an upgrade of the heating system in our house I decided that a more sophisticated control of the heating than an on/off thermostat would be a nice feature. The Czech Protherm company (member of Vaillant concern) supports EBUS in their recent products. (vii) avoiding additional hardware running an operating system, keep it as simple as possible for high reliability. I have decided to use the LPC1343 MCU, which supports USB and the ENC28J60 SPI/LAN interface module, which is at Aliexpress cheaper than buying individual components at small quantities. Notice that at least two versions of the ENC28J60 module are on the market, one needs 5V power, the other 3V3 power (and is not 5V tolerant). My design assumes the latter, which can be connected directly, the former needs a flexible cable and rearrangement of the order of the pins, but both versions work. Basically I took my previous design with LPC1343 which had USB and LAN interfaces, added a 433MHz OOK communication module and an optoisolated EBUS interface based on an existing design. The schematics in PDF can be seen here and open hardware full design Kicad files are here. Notice that some parts are not included - I dropped the EEPROM, I2C-connected LCD display, and rotational encoder, as at the moment I did not plan to fully replace the existing thermostat, just to modulate the heater power by setting heating water temperature based on outside temperature transmitted from my homemade meteostation and possibly remotely control the heater. A lot of work has already been done in this direction, which can be found on some german discussion forums (partly in german language, which I fortunately understand) and on EBUS Wiki , see also PDF from EBUS wiki. It turns out, that Vaillant does not use at all standard EBUS commands and implements its whole communication by the proprietary commands (0xB5). The Czech Protherm company has been acquired by Vaillant and obviously they stopped their own independent firmware development and adopted fully Vaillant's firmware and communication standards, at least in the product I purchased. The aim of my reverse engineering was to verify whether Protherm is indeed 100% compatible with what was already known about Vaillant communication, and how to emulate the behavior of original Protherm's EBUS thermostat and control the heater, specifically set the temperature of tap water and heating water, modulate thus the power of the heater, switch the heater on/off, and change the operation mode (tap water, heater water, both, none). (ii) Connect the thermostat only to my EBUS interface, power the EBUS from 22V/0.02A power supply through 220R resistor and emulate the communication of the heater by hand. I have verified the compatibility of my Protherm Panther condens 25 KKO heater with the Vaillant commands as described in the PDF from EBUS wiki. The B510 and B511 commands are then repeated indefinitely each few seconds, in alternate order. When user changes the temperature setting or the thermostat finds out it should switch heating on, the parameters of the B510 command change accordingly. The B504 and B513 commands are inserted into the command sequence time to time. I have found that once the EBUS thermostat is connected and sends its commands, the temperature setting buttons on the heater panel become inoperative, even if the EBUS thermostat is disconnected again. Only after a reset or power cycle one can set temperatures on the heater manually again. which seem totally irrelevant, at least for the purpose of thermostating. Finally, I did NOT find out whether/how one can change the mode on the heater via EBUS (there are 4 modes: off, tap water only, heating only, heating+tap water). The mode button remains active even when EBUS thermostat is connected. I have found that the command 0xB510 is sufficient to control the heater. 0xB511 can optionally be used to read out temperatures. Moreover I have found the meaning of LSB of the byte M12 of the 0xB510 command: if 1, the heater switches off, if 0 it switches on/off depending whether there is a jumper on the on/off control clamps. 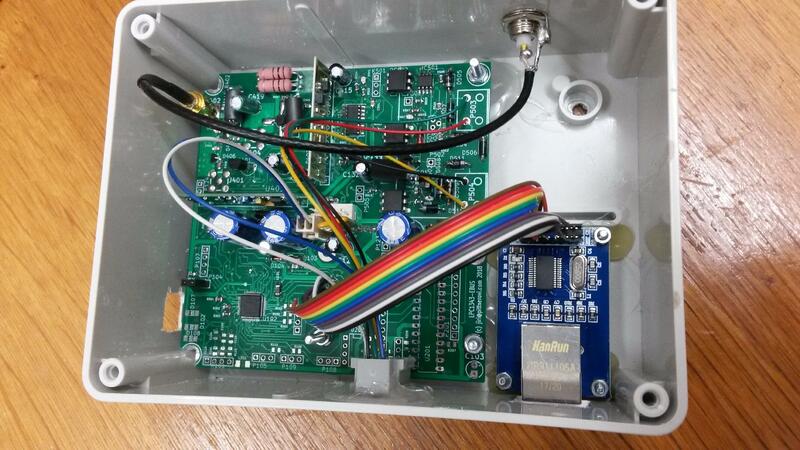 When using an EBUS thermostat, there is a jumper (factory installed) and the thermostat uses this bit to switch the heater on/off and the M8 and M9 bytes of the 0xB510 command to set the water temperatures. I plan just to set the heating water temperature based on the outer temperature using this device, and use already existing thermostat to toggle the heater on/off - keeping thus this bit = 0. As my device does not run an operating system, I could not use the ebusd program, but developed a simple firmware to interface EBUS control of the heater to other communication interfaces. It is specifically oriented towards Protherm heaters, which are compatible with Vaillant, but incompatible with other EBUS devices. The firmware will read/write any EBUS communication, but higher level functionality like setting water temperature is implemented only for the proprietary Vaillant commands, corresponding to the hardware I have at my home. The firmware source code (GPLv3 licensed) is included in a package of all my developments for LPC microcontrollers, see the arm_lpc111x.tar.gz file. In particular, the core of this project is in ebusint.c and lib/ebus.c files. By various #ifdefs you can select whether it will only listen on the bus, or whether it will set tap water and heating water temperatures. USB, LAN UDP and 433MHz communication is also optional. Full thermostat functionality is presently not implemented, as I keep the previously developed thermostat in use, while the EBUS interface just listens temperature reports from a meteostation and sets the heating water temperature appropriately. However, coding the thermostat would require just reading rotational encoder and writing to LCD display, for both of which I have already library routines, so it would be very easy to do if needed.